Happy Monday everyone! Can you believe that after today there are only 3 more Mondays until Christmas? I'm starting to feel quite festive now but I really need to get a wriggle on and finish buying presents! How has your week been? I've had a busy one but it's been pretty lovely. There is always so much fun stuff to do at this time of year, isn't there? This week I have dedicated a little bit of time to practicing yoga and I have really enjoyed! It feels great to have a little stretch and and feel the burn without doing anything too strenuous, and I think the quiet time has done my mind a lot of good. Let me know if you know of any good yoga practices on YouTube. I don't know why I've never picked this up before but OH MY GOD it's amazing. We had a couple of little squares as a treat after dinner on Monday and it really hit the spot - plus it isn't quite as naughty as some of my other chocolatey vices! The rain was biblical in Leeds on Monday night - it was dark, cold and I was really craving comfort food. Sam whipped us up some delicious sausage and mash (complete with his epic red wine gravy) and we ate it while sitting in our cosy living room watching Planet Earth. It was perfect. I was in London for a couple of days for work this week, and on Tuesday evening my boss and I headed over to Winter Wonderland for a little mooch. We had a little go on Olympia Looping (which I'm told by my geeky boss is the world's largest travelling rollercoaster!) and marvelled at all of the pretty lights. I was surprised by how huge Winter Wonderland was and I'd love to visit again when I have a bit more time. This week I booked an early bird ticket for Traverse next year! I was gutted to miss it this year so I'm really looking forward to attending some of the events in London in April. Unfortunately the main weekend clashes with my hen do (yikes!) but I'm hoping to spend the Thursday and Friday doing as much as possible. One of the perks of working down in London every now and then is getting to catch up with friends who live down there. On Wednesday I got to hang out with one of my besties from uni - I had seen her last weekend as she came up for our bridesmaid get together, but it was lovely to have a proper catch up. Plus we ate a giant pizza and drank wine at Homeslice which made it even better! On Friday night we had my little cousin Hudson staying over and we had so much fun hanging out with him. He'll be 3 in February and has so much personality - he had us in stitches with all the funny things he said! I honestly think that hanging out with kids works wonders for the soul and he definitely made our weekend happier. I've watched so many Christmas films this weekend and I have thoroughly enjoyed it! We watched Elf, The Polar Express and numerous cheesy films on Christmas24 - they made me feel very festive. I've still got lots of classics to get through before December 25th and I can't wait! 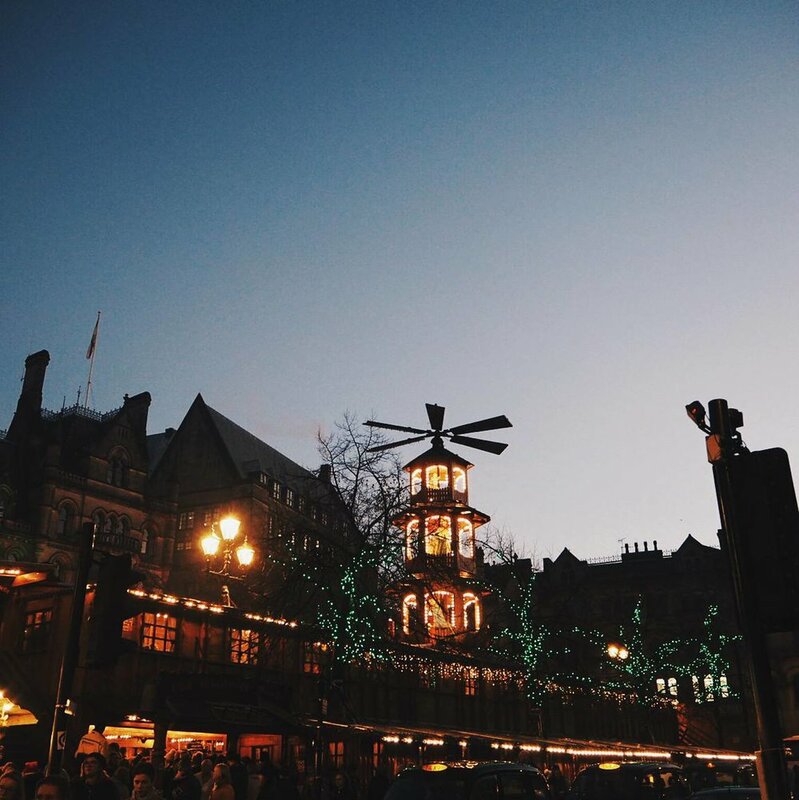 On Saturday afternoon Sam and I headed to Manchester with my Mum, Dad, sister and her boyfriend to wander round the Christmas markets. We had a lovely couple of hours - I had my first mulled wine of the year and my Mum and I shared a delicious flammkuchen. Food and drink is definitely the best part of any Christmas market in my opinion! Yesterday I spent a couple of hours on the sofa planning blog posts, taking photos and getting lots of writing done! I feel like I've got lots of blogging inspo at the moment and I am so excited to put some plans into action in the next couple of months. Plus it always feels good to have a few posts lined up!